Port Blair, Cellular Jail, Museums, Corbyn’s Cove, Water Sports Complex, Viper Island, North Bay, Ross Island, Mahatma Gandhi Marine National Park, Red Skin Island, Havelock Island, Limestone caves, Mud Volcano, Hut Bay Islands, Mount Harriet Islands, Car Nicobar, Katchal & Great Nicobar. Adventure -Water-Skiing, Sailing, Windsurfing, Speed Boating, Snorkeling, Island Camping, Scuba Diving, Trekking etc. By Air: The Island has its domestic airport at Port Blair, which has regular flights operating from Kolkata and Chennai. Helicopter services operate between various islands. 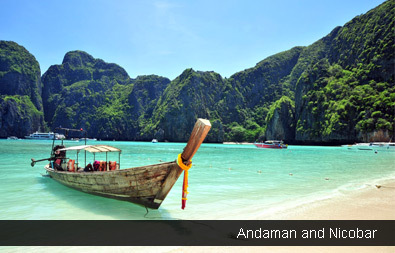 By Sea: Cruising through the Bay of Bengal is a delightful experience to reach Andaman. Regular passenger ship services operate to Port Blair from Chennai, Kolkata and Vishakhapatnam. 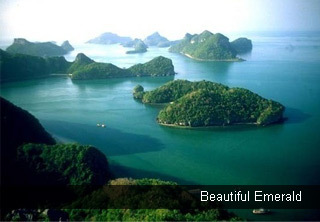 The archipelago of Andaman and Nicobar islands are abundantly bestowed with incredible beauty. Covered with dense tropical forests, these islands have an equally enchanting past. The first documented human presence on Andaman and Nicobar islands was recorded in the 2nd century. The historic Chinese monk traveller, Xuan Zang during his journey through India verified the tribal development. Since then, the eastern islands of the Bay of Bengal have been shrouded in secrecy due to their isolation and unique topography. In the late 17th century, these islands came under control of the Maratha warriors who occupied many other regions on the peninsular India. Two centuries later, these small islands came under the direct occupation of the British who utilized their isolation in punishing and detaining the criminals and the freedom fighters of India. At that time, Andaman and Nicobar islands evoked a fear of separation among the Indians as a punishment of Kalapani at Cellular Jail at Andaman Islands. During the Second World War, the islands came nominally under the control of the Japanese. Post Indian independence, the islands became the part of the polity 1950 and were declared a union territory in 1956. Geographically, these volcanic islands float in extreme isolation in the Bay of Bengal and accommodate a unique ecosystem. Once a hill range extending from Myanmar to Indonesia, these picturesque islands are covered with dense damp tropical forests and endless varieties of exotic flora and fauna. Post Tsunami, only 24 islands of Andaman are inhabited. The ecosystem here is equably blessed with flora and fauna. Here innumerable birds chirp on the beach islands and cool coral atolls bestow a pristine and beautiful aura to the Andaman and Nicobar islands. Around 270 species of birds dwell in these islands. In terms of faunal heritage, the islands are richly blessed with Wildlife Sanctuaries, National Parks and a Biosphere Reserve. Another offshore phenomenon that adds on to the enchanting appeal of the islands is the coral atoll ecosystem. This varied eco-system features many water based species like coral reefs, sea turtles, bottlenose dolphins, tropical fish and other land based seabirds, reptiles and butterflies. The azure blue beaches are also known for bountiful adventure activities world-class scuba diving, swimming, snorkeling and bird watching. Culturally, the land and its people are indigenously tribal in nature. This is evident from the fact that 3,000 years old Jarawa tribe still dwells in the remote Andaman forests. For a culturally extensive holiday, it is preferred to begin the journey during the Island Tourism Festival. During this festival, the islands come alive with the cultural performances, exhibitions, puppet shows, baby show etc and aquatic festivities like Floating Restaurant, the Canoe Race and scuba diving. Hotels –A tourist needs a permit to visit only certain parts of Andaman Islands. Make sure to keep the passport copy and few passport size photographs in order to receive a permit on your arrival at Port Blair, the capital of Andaman and Nicobar islands. Hospitality wise, the union territory has a number of hotels and lodges to accommodate a discerning traveller.